On Thursday, August 6th we are excited to feature a unique menu of indigenous, Native American foods prepared by Chef Sean Sherman, also known as The Sioux Chef. 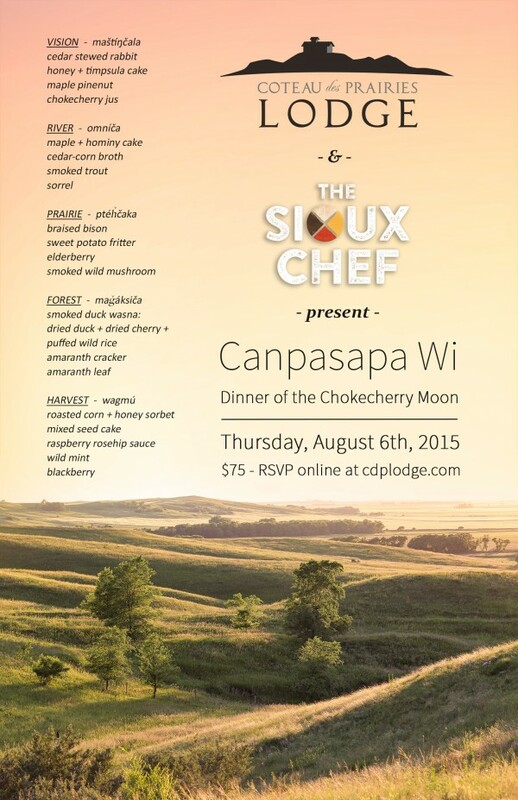 Canpasapa Wi means ‘Dinner of the Chokecherry Moon’ and in the height of the summer growing season we will be celebrating the cuisine of the forebears of the northern plains and their immense pantry of readily available foods. Expect to see a beautiful and modern interpretation of traditional Native American foods as well as fascinating presentations about the indigenous foods of this place we call home. Sean gave a great interview on Prairie Public Radio on July 20th about the work he is doing with indigenous foods. If you would like to hear more about Sean’s fascinating work, click here. To highlight local products we are featuring produce from Riverbound Farm, a CSA near Mandan. A selection of their fresh, seasonal vegetables will be incorporated into the menu. The owners of Riverbound Farm will be in attendance and will be happy to discuss CSA farming and the joys of eating local. 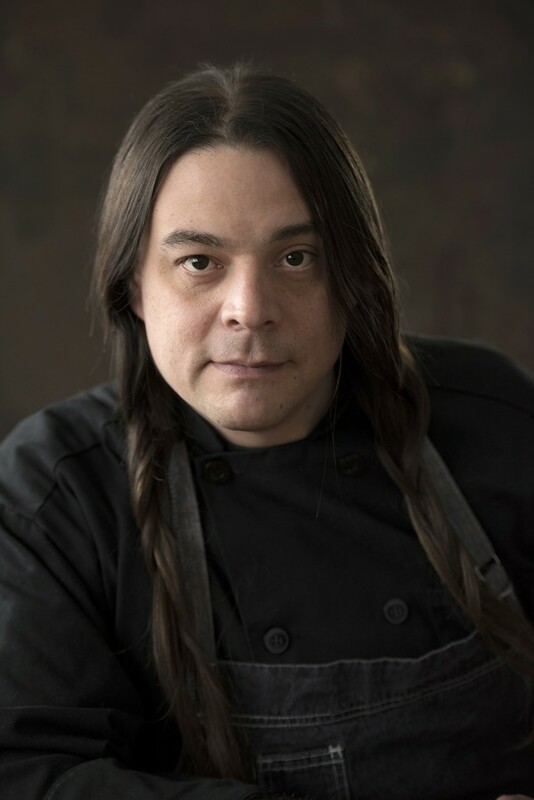 Through documentation and experimentation with wild and indigenous flavor profiles and recreating and utilizing “ancient pantry” items, Chef Sherman has been readying his own concept of Modern & Traditional Native American Foods of the Dakota, Lakota & Ojibwe to bring to the public. This year, he opened his business titled, “The Sioux Chef” as a caterer and food educator to the Minneapolis/Saint Paul area. His focus now is providing catering, cooking classes, speeches and food demonstrations. He’s been able to source locally, organically and using many regional Native run businesses to bring the flavors of these traditional foods to the Minnesota region and beyond. 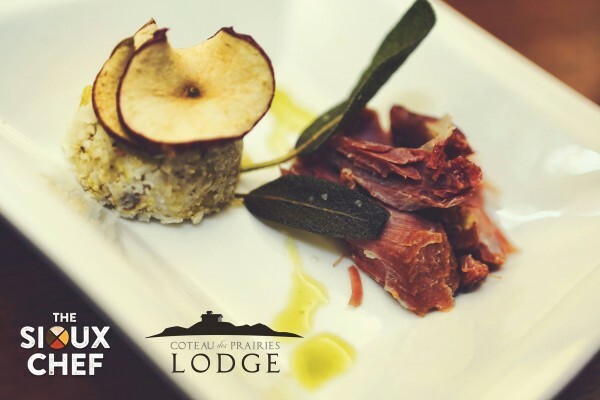 The event is on Thursday, August 6th at Coteau des Prairies Lodge. Everyone is welcome, but space is limited and meals are available by reservation only. The price is $75 per person which includes a multiple course gourmet meal and informational presentations about indigenous Native American foods by Chef Sean Sherman. Suggested pairings of wine and beer will be available at the bar. Water and coffee will be provided. Doors open at 4pm, guests are welcome to come early, tour the lodge and enjoy refreshments served at the bar. When you arrive at the lodge, sign your party in with our hostess. Guests will be seated for the meal promptly at 6pm.